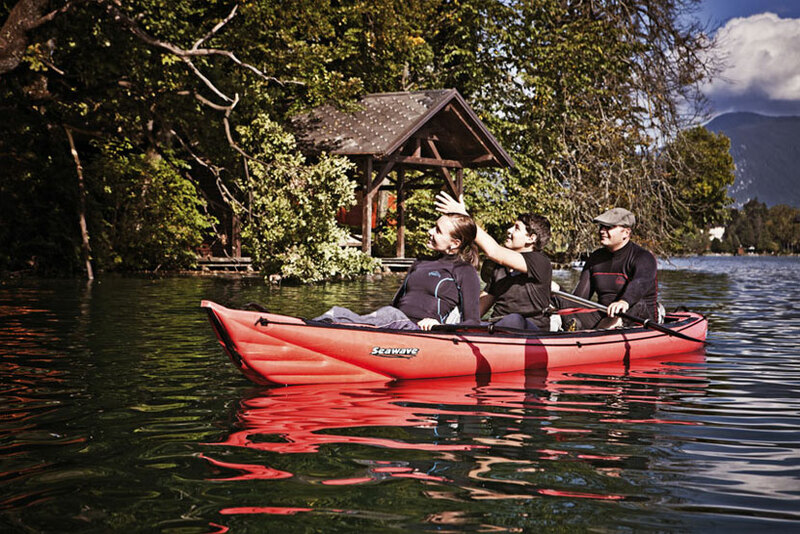 Versatile and high performance tandem kayak for inland and coastal touring. The Seawave from leading inflatable manufacturers Gumotex has to be one of the most versatile inflatable kayaks on the market. The kayak has a large central air chamber on the underside providing a pronounced V shape to the hull. This in turn provides excellent straight line tracking on windier days or when covering longer distances. The hull material, much like the rest of the Gumotex kayak range is a durable Nitrilon. Not only does this give high abrasion resistance, it also allows higher operating pressures, and can easily be easily dried out after use. 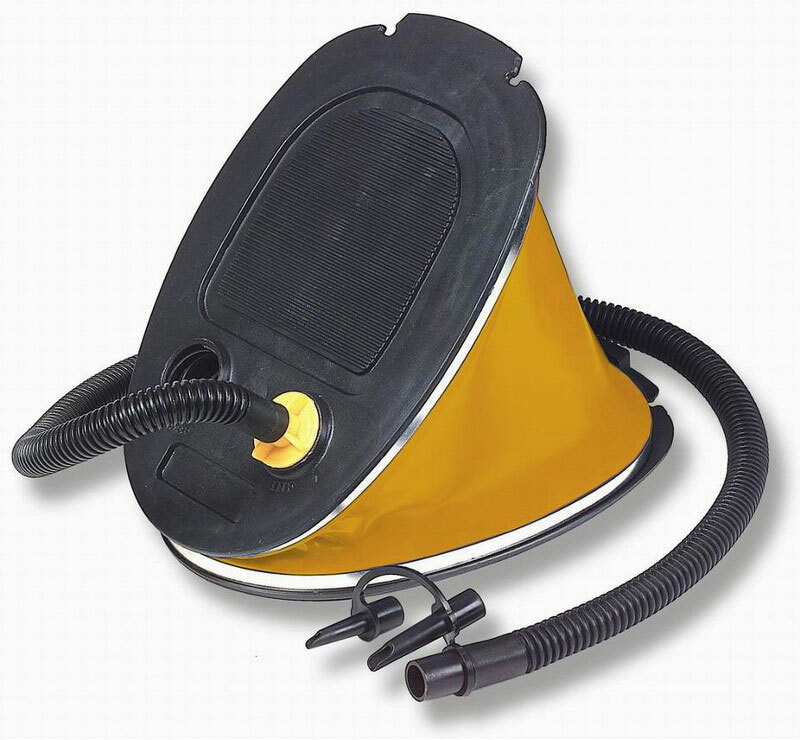 Providing a lighter weigh option, to ‘bladder’ style inflatables. 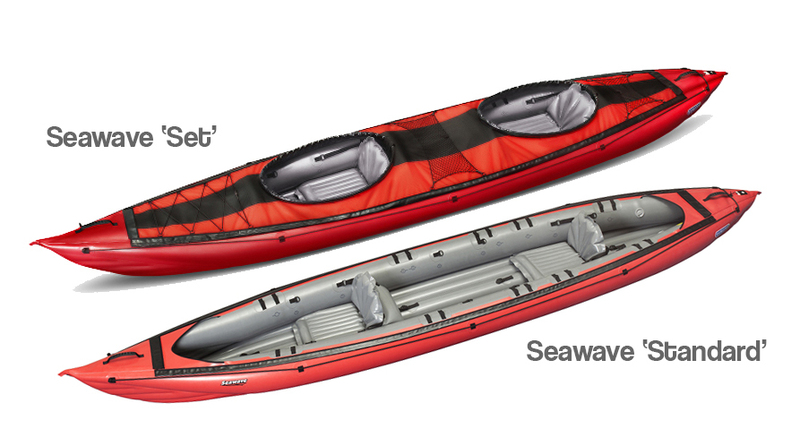 What makes the Seawave so versatile, and what sets it aside from other inflatable kayaks is the different options and layouts that can be achieved from the standard boat. The Seawave has the option to have 1, 2 or 3 seats (3rd seat supplied separately or with the ‘Set’), which can be moved in positions around the boat easily and quickly, to accommodate different configurations of paddlers. The Seawave design is a great boat for most of the waters encountered throughout the British Isles, and on the Continent. 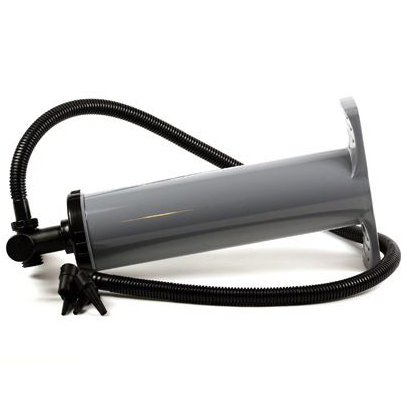 Well suited for inland touring on lakes, canals, reservoirs and slow moving rivers. The Seawave can also be used on sheltered coastal excursions and estuary explorations. 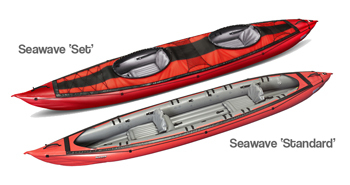 For paddlers wanting to go out in inclement weather, or under more demanding conditions – then the Complete Seaweave Set is available to modify the Standard Seawave to a more serious watercraft, turning an open cockpit kayak, into a closed cockpit kayak. The Set comes with alloy cross braces which support a waterproof fabric deck (one or two person) with cockpits for superior weather protection, choppier seas and providing even more stiffness to the hull. Please contact our knowledgeable staff if you have any questions on the Seawave and its various options or accessories. Drain opening in the boat´s stern. Velcro edging for affixing the spraydecks. End carry handles for easy handling. Safety ropes affixed to the side tubes. Fixture for tracking fin (included). Safety relief valve in the bottom chamber of the boat. Standard Seawave Boat, 2x Seat/Backrests and Transport Bag. 1 and 2 Person Decks/Cockpits, and Internal Braces. 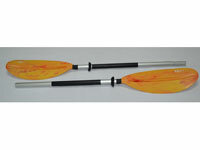 2 part kayak paddle with push button spigot joint by Sevylor. You can buy a Gumotex Seawave online from our website and pick it up from ourselves or from any branch within the Canoe Shops Group. There is no cost associated with instore collection*.